Founded in 2003 and headquartered in California, Del Real Foods is a family business committed to preserving the rich gastronomy and traditions of Central Mexico. Designed to satisfy all palates and promote healthy eating, Del Real Foods refrigerated products offer authentic taste, using the freshest, locally sourced ingredients and cooked with traditional methods for an enhanced dining experience among family and friends. 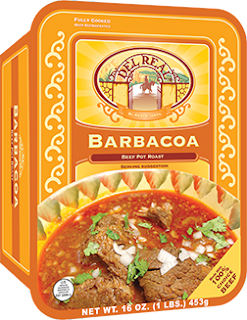 Del Real Foods refrigerated products include carnitas, barbacoa, tamales, seasoned shredded beef, shredded chicken and more. · Authenticity: the family strives to create deliciously simple products based on traditional recipes infused with Mexican culture and bold colors. Prepared in an industrial, home kitchen, the products will provide comfort and familiarity. · Healthy People: cooked with a safe open-kettle method, the products are made with the freshest, ingredients, most of which are locally sourced. Once prepared, they are ready to enjoy. The products are also gluten free and do not contain any trans fats. · Healthy planet and better communities: the company has adopted sustainable initiatives including wastewater management and recycling to help the environment. Del Real Foods has also sponsored local sporting events and made donations to local communities to contribute to their improvement. Now I am not the type of person to try very exotic cuisine, I am not a person that is up for pickled squid or anything like that… I do like to try new types of foods just nothing too out there. I was very fortunate to be able to try an assortment of Del Real Mexican foods. I was concerned that it may be too spicy would it be too my family to want to eat. I am happy to say we were very impressed with Del Real Mexican foods, it was a great variety of new flavors that my family loved. 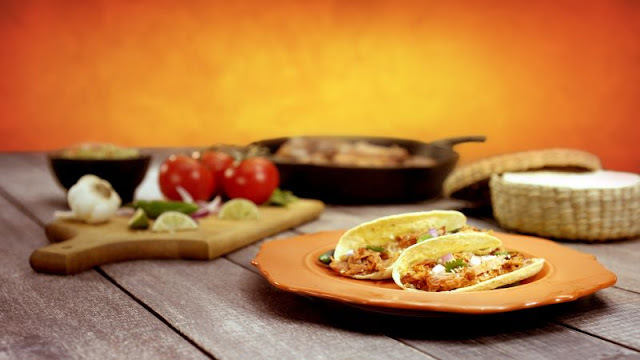 Carnitas - Bursting with rich flavor, carnitas, a type of fried pork, is a staple in the Mexican kitchen that we are happy to have the opportunity to share with you. Our carnitas have a unique and authentic texture and flavor rooted in the traditional cooking methods of Michoacán, a Mexican state known internationally for their delicious, melt-in-your-mouth carnitas. Richly seasoned, slow braised and deep-fried, carnitas make a flavorful and filling main course, but they are also incorporated in many other authentic Mexican dishes like tamales, tacos, tortas and burritos. Carnitas are traditionally served accompanied by cilantro, salsa and refried beans. They can easily be used to spice up American dish favorites like pulled pork sandwiches, omelets and even pizza. Now this is something new and different, this had a wonderful seasoning and a great spiced flavor. I used this to make sandwiches, the meat was very tender and worked so well with the sandwich. My husband adored this tender spiced meat. I squeezed some lime on the top, and thoroughly enjoyed my tasty sandwich. I would love to get this again and use it as a pizza topping, or even a burger topping for a divinely delicious meaty burger treat. Barbacoa - Barbacoa is more than a meal. When your family and friends gather around this dish at the table, it will become part of a family tradition, just as it has in ours. Made with 100% Choice Beef or better, this Mexican-style beef pot roast is simmered in a delicious and hearty tomato and chili sauce. It has an authentic and traditional Mexican flavor, but is mild enough for the whole family to enjoy. Savor this entrée alongside our delicious Arroz Mexicano and seasoned Frijoles Negros, or use it as a standout ingredient in burritos, tacos, enchiladas and salads. Top it with onions and cilantro when you’re looking for a traditional taste, or find your own favorite flavors to add to it. A Mexican style post roast, now this is intriguing… I am a big fan of traditional pot roast and to try a Mexican version I was quite excited… I cooked up some rice and mixed it with some salsa, and topped the rice with the beefy post roast. My family adored the quick and easy dinner, it tasted like I slaved hours in the kitchen, but it really only took me about tem miunutes to cook up the meal and make the rice, then put it on the dinner table easy as it gets and delicious too. 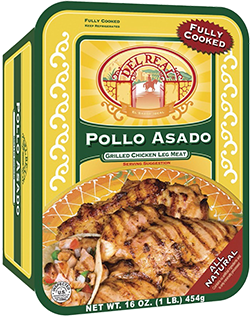 Pollo Asado - Del Real Foods’ Pollo Asado is as flavorful as it is versatile. The grilled chicken is seasoned with a traditional blend of spices and marinated in a zesty citrus blend before being cooked to perfection. Our Pollo Asado is delivered to your kitchen in 6 to 8 ounce portions that can be sliced, diced or served as an entrée. This flavorful food makes dinner preparation a breeze and it can be included in everything from tacos and burritos to salads and teriyaki bowls. Use it with other delicious Del Real cuisine or experiment with other recipes to find your family’s favorite. I have always been a big fan of chicken, it can be used in so many ways and spices any way you could want it. For this particular dinner I wanted to do a cultural fusion type of dinner, I made some cous cous and made a Moroccan, Mexican meal (I know I know, that is different!) I made it with traditional Moroccan seasonings and topped it with the Pollo Asado, the citrus favor of the meat worked well with the spiciness of the Moroccan cous cous, this meal was a home run and loved by all. Beef Tamales & Pork Tamales -Following our traditional family recipe, Del Real Foods tamales are prepared with only the most delicious and authentic ingredients. Wrapped in cornhusks to preserve the delicious flavor and texture, our masa is always soft and moist. The delicious beef & pork filling is seasoned in a rich red sauce that has been perfected by generations. Tamales usually take a skilled hand and hours to prepare, but with Del Real Foods you can have the authentic taste of Mexican tamales any time you want. This easy heat-and-serve dish makes a wonderful entrée, but can also be served as a side dish or appetizer. The taste was so authentic, it reminded me of the handmade tamales I had when I visited Mexico earlier this year from a stand at a local Mexican market. The beef and the pork was so tender in these Mexican tamales. The meat was so very tender and melt in your mouth good. These tasted just like the handmade fresh tamales I enjoyed in Mexico. The tamales were easy to make, and took minutes in the microwave. Each pack contains 6 large tamales, so this was a generous amount, I was able to share some with my parents and my in-laws. First I have to tell you my mother, does not like many things, she is a basic gal when it comes to food… But she loved the pork tamales she got to try, she said they were amazing! My in-laws also enjoyed the lightly spiced meat and the flavorful masa that covered the meat. Cheese and Bell Pepper Pupusas - Following a traditional family recipe, our Pupusas are full of delicious and filling all-natural ingredients. Pupusas were first created by the Pibil tribes of El Salvador thousands of years ago and are now enjoyed by people all over the world. We pack thick corn tortillas with a combination of cheese and mild green chilies to create a mildly spicy, rich flavor perfect for everyone to enjoy. This dish is traditionally topped with curtido, but can also be accompanied with salsa or cut open and stuffed with many Del Real Foods favorites like Carnitas, Barbacoa or Frijoles Fritos. My daughter just adored the Cheese and Bell Pepper Pupusas, they reminded her of the quesadillas that she loves, warm and cheesy, a delicious snack or side dish. These Pupusas are filled with a mildly spiced cheese that had just the right amount of cheese. It tasted great alone, and dipped in salsa. My spice loving husband sprinkled some siracha on his and loved it. All of these meals can be cooked in the microwave in minutes! I know what you may be thinking, a homemade meal from a microwave? Will it taste the same? Or will it just taste like frozen Mexican food from the supermarket (yuck, I have had the run of the mill Mexican food from the supermarket… it is nothing to write home about at all ick..) … Well I have to tell you that it is possible to have a great tasting meal that is from the microwave! The food was easy to make and delicious, and the boxed food like the carnitas, Barbacoa, Pollo Asado are suitable for freezing, so you can stock up on these great meals, and they will last in the freezer. 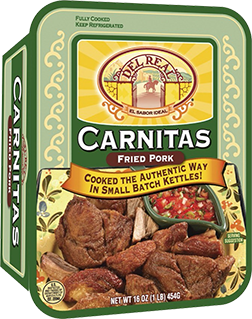 So if you would like to try something that is different (but not too different) I would highly suggest picking up some Del Real Foods meals. Your family will surely love these great meals. They are quick to make and are great for a working mom like me. I could have a tasty dinner on the table in a matter of minutes! 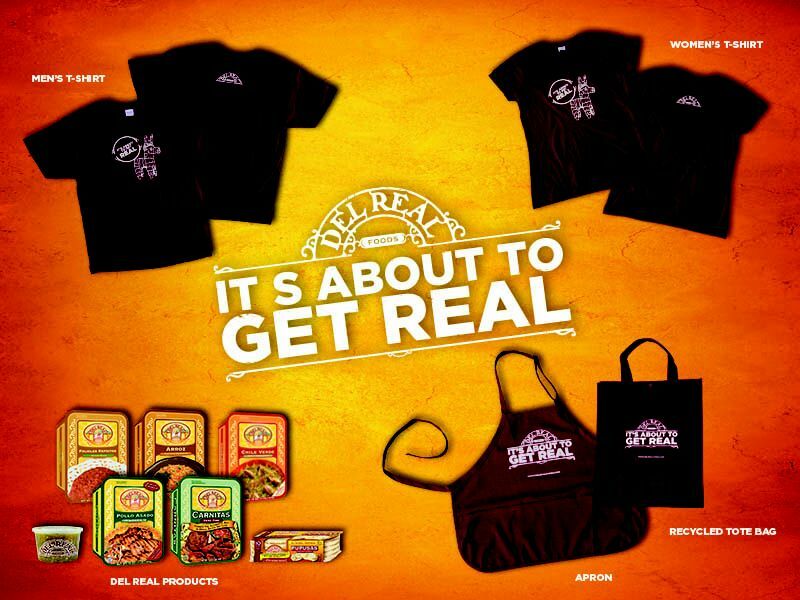 Del Real Foods is available in certain location, but there are no locations near me. Luckily, they also sell their great items online! So that is a great way to order if there are no stores near you. 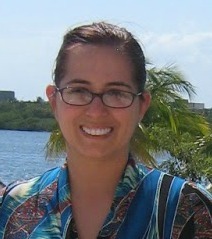 The generous folks at Del Real Foods, are giving Susan’s Disney Family readers a chance to win! Would you like to give Del Real Mexican food a try? 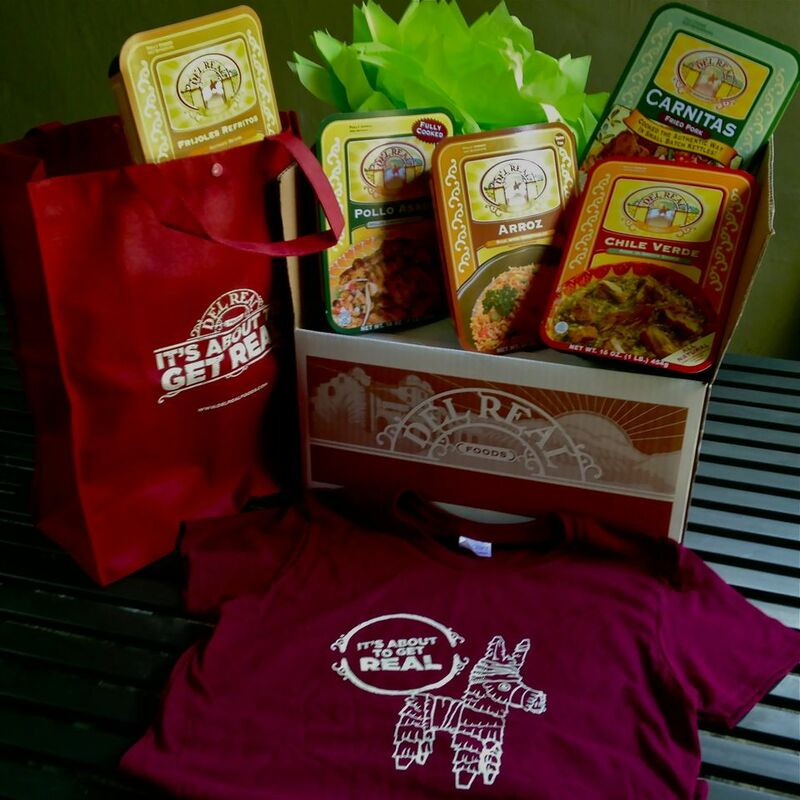 I’m giving away a “Party In A Box” featuring Del Real The box is filled with food, a shirt and a bag to tote all of your goodies in! Would you like to win? Please check out the a Del Real Foods website, take a look around then come back here and tell me something you learned from the site. There are also other ways to enter, please enter below. Disclosure: The reviews and or opinions on this blog are my own opinions . I received a box of various food items from Del Real to review. No monitory compensation was received. I was not required to write a positive review. Your experience may differ. The opinions I have expressed are my own I am disclosing this in accordance with the Federal Trade Commissions 16 CFR Part 255: Guides Concerning the Use of Endorsement and Testimonials in Advertising . I would love to try the Arroz, Rice with Vegetables. The the Cheese and Bell Pepper Pupusas look so good! the tamales and the pupusas... we often have to drive to Southern ME or RI to get food that we like, so I like the fact that you can order them online, though I'd love to try them first lol.. I'd love to try the arroz!!! I want to try the shredded chicken. I want to try the the Bell Pepper & Cheese Pupusas. Pupusas - one of my favorites! I used to live in an urban area, with plenty of real mexican foods.. I cannot get them anymore in this rural area I live now. I would LOVE to get the tamales...oh man yes. I would love to try the carnitas! I would love to try the beef tamales. They look really good. Thanks! i want to try the Barbacoa. The sweet corn tamales!! And the sopes! I love mexican food and would love to try all of it. I'd like to try their chicken tamales in red sauce. I want to try their carnitas! I would love to try the Carnitas. I would like to try the shredded chicken. I would love to try their tamales- I love tamales and you make theirs sound fabulous! I would love to try the Pork Tamales and the Shredded Chicken! the tamales! I LOOOOOVE tamales!! I would love to try Cheese and Bell Pepper Pupusas from Del Real Foods. I love corn tortillas &, even tho the green peppers make me burp, its worth it! Pollo Asado and the Beef Tamales would be outstanding!!! I would love to try their Chipotle Chicken Tinga heat-and-serve dish. I love bell peppers so I would love to try the Cheese and Bell Pepper Pupusas. All the foods looked so scrumptious, I want to try them all ! Cheese and bell pepper pupusas sound real yummy! I would love to try the Pollo Asado!